Today's guest post is from Rabbi Allison Vann, the spiritual leader of Suburban Temple-Kol Ami, in Beachwood, Ohio (a suburb of Cleveland, Ohio). She is married to Charlie Vann, and has the cutest little kindergartener, Isaac, and two dogs, Frankie and Zeke. Follow her tweets @rabbivann. I blamed not getting my sermons done for the High Holy Days on the fact that my laptop was old. I ordered a new one. Now my excuse is that my son started kindergarten. Our ancient rabbis had a deep understanding of our psyche. We often give credit to breakthrough thinkers such as Freud, or Jung- but credit is due, in large part, I believe, to them. The Rabbis knew we needed Elul. Elul is about preparing for the High Holy Days. Elul helps make sure we don’t have so many excuses that we miss our chance. The rabbis knew we are prone to making excuses. That when the work is hard, or intimidating, or just plain old “have to”, it’s way easier to make excuses. So we do. And so we have Elul. To “come clean”--and know that when we have work to do, and we’re not getting it done-then we’ve got even more work to do. So, today-- if we’ve got so many excuses, let’s say ‘thank you’ to the rabbis--for the opportunity to figure them out. And stop making them. Our tradition teaches that we are all created "b'tzelem Elohim," in God's image. When we consider that every single person we encounter fits into this idea, it can change the way in which we interact with others. So often we fail to see the humanity in another person. If we all would remind ourselves of this idea, the world would be a very different place. How can we live this ideal in the new year? The high holy days are all about change. Not only are we changing the calendar, we are asked to change ourselves. To consider the parts of ourselves that we hope to repair, renew, redirect....and change them. It's much easier to float along. Keep going the way things are going. It is so difficult to turn around, to take a different direction, to move in a new way. And so the holidays come. As hard as we can...sometimes we do not make it. 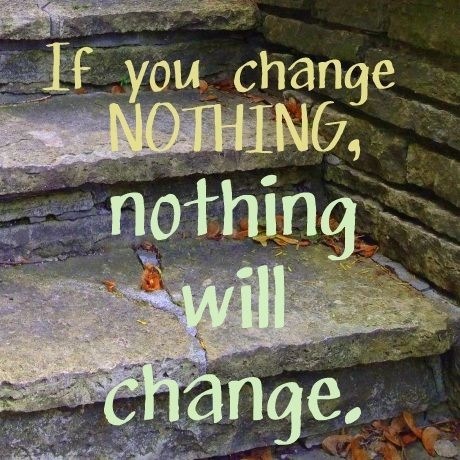 But if we don't make the changes ourselves, then change will come. And we might not like it. We might not control it. Maybe we can control it. Maybe we can mold it and shape it and make it work. Isn't that worth trying for? I took this picture using my BlackBerry. Many visitors speaking many languages. And audio tours in all their tongues. What would it be like without the tour? I could write about so many things today. But the blessing of this blog is actually what I'm going to focus on. Not that other blog. But this one. I was scrolling back through old posts to look for something. And I realize what a blessing blogging has become for me. It has helped me to frame our stories, to put our lives in perspective, to record our milestones in meaningful ways, to gain community, to stretch myself and to grow...it has opened doors out of the blogging world and it has opened my mind and heart within it. I can truly watch the progression of my family's growth over so many years....it has given me an outlet and a chance to look inward. It has helped to define me and helped me to define myself. It is a work of love and pride and honor and learning and teaching and brings a wholeness to my life. I had never been a "journal keeper" before. I didn't know what to expect when I started this blog. But what a blessing it has been...and I hope to continue for many posts to come! Has there been a blessing that has come into your life whose blessing you only discovered later? I think I have a lot to say about prayer. But words fail me today. Leave your BlogElul or ElulGram post in the Linky below! And, interestingly, today's topic is "trust." I've never thought much about how important trust is when we deposit our most precious people for hours on end in a school building. We kiss their little heads, wave goodbye, and trust that they will be well-cared for. And we trust, as we push them out into the world, that they will land safely. We try to break their fall, to guide them on the way. But ultimately, someday, we have to trust in their own inner ability to do what they need to do, to become the people that they need to become. Sometimes...we hold on too tightly. We forget to let go...and just trust. Leave your own BlogElul post in the Linky below! We Jews are always counting. We count the days until Shabbat. We count the days until Rosh Chodesh. We count the days between Rosh HaShanah and Yom Kippur. We count the days until brit milah. We count the Chanukah lights. We count the books of the Torah and the Mishnah and the Talmud. We count the heads needed for a minyan. We need 10 for a minyan, yes, but our tradition does not really allow us to count those heads. Why? Because people are precious. They are sacred. They are not like jewels or gold or money or sheep or any of the other things of which we keep a count. Sure, it might sound like a superstition. And maybe it is. But it makes you stop and think. It is a strong reminder of what is really important. We can count prayerbooks or kippot or make up any system we want for ensuring 10 heads at a minyan. But in the end, it's the people who matter. But we have to remember what really counts. 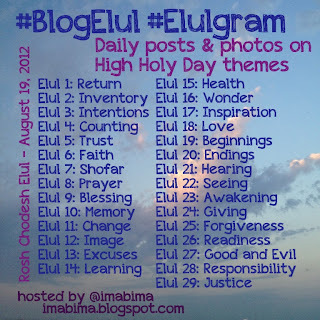 Share your BlogElul and Elulgram posts for Day 4 in the Linky below! If you've never done this before, it's good - it will give us a list of all the people making posts today! I hear this all the time from my kids. "I didn't mean to hit you." "I didn't mean to throw that toy across the room." "I didn't mean to hurt my sister's feelings." And most of the time, they are actually telling a truth of sorts. The action may have been intended, but its outcome was not. "I meant to hit you but I didn't mean for you to get angry about it." "I meant to throw that toy across the room but I didn't mean for it to hit the lamp." "I meant to say those things to my sister but I didn't know how she would react." I did not intend to eat the whole cookie. Is it enough if I didn't imagine all the outcomes of my actions? Is my intention "pure" if I never even began to consider what would happen if I....you fill it in. Good intentions, as we all know, can lead to terrible things. But what about intentions that are only half-baked? "I didn't think that one through." I think it's more than trying to "do good." I think it's about considering all the outcomes before acting. But one to work toward. 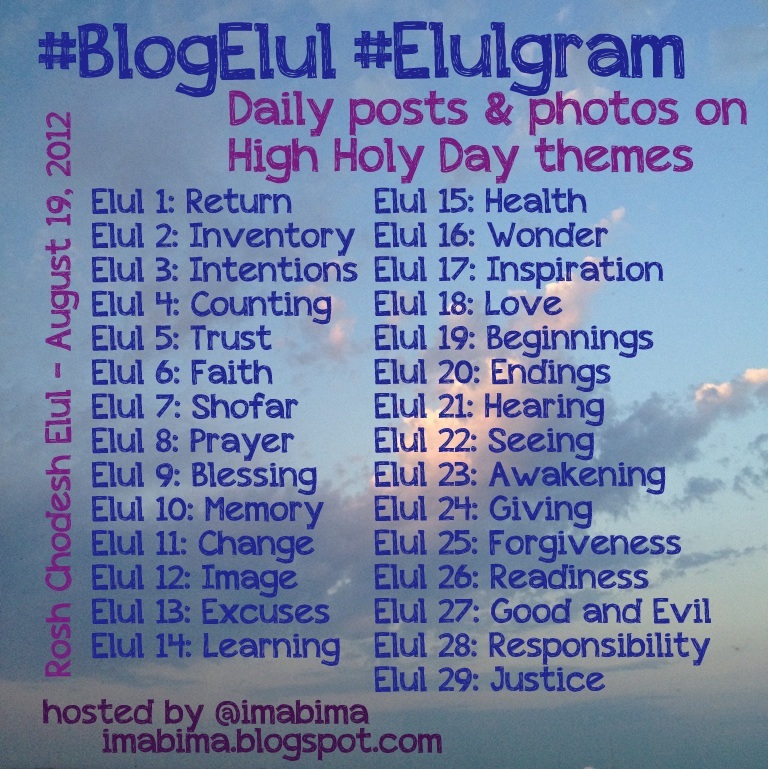 Share your BlogElul and Elulgram posts in the Linky below! If you've never done this before, try it! It will give us a list of all the Day 3 posts. In the preparation of the month of Elul, we hear the Hebrew expression "cheshbon nefesh" - accounting of the soul. It is going to sound silly, but it is because of this expression that I can remember what to say in an Israeli restaurant when I'm ready to pay the bill: "Cheshbon, bevakasha!" or..."check, please!" Perhaps it's just because I like eating in restaurants, but I love the imagery of blending the mundane (accounting of the eggs, toast, and coffee), with the spiritual (taking stock of our soul). It's pretty easy to add up all the things we had to eat at a breakfast out. It becomes much more complicated to take inventory of one's soul. How do we do it? How do we "take stock" and figure out what's there? Is your soul a jumbly mess, like a cluttered-up attic with too many generations of junk treasures inside? Or is your soul an orderly closet with the sweaters lined up neatly by color and type? And is one really better than the other? Many people with a messy desk will tell you they know where everything is - is a messy soul any different? For each of us, this soul-counting business is different. I like to do it all at once, an early morning sunrise walk or a meditative stroll through the Botanic Gardens. I recount and consider all that has happened. For others, it's a more spread-out process, perhaps thinking about a month at a time, or focusing on certain traits or ideas that they had hoped to work on during the year. There's no wrong way to do it. There's no wrong system of organization. You have to ask for the check. You have to add it up. And you have to pay your bill. Today is the first day of the month of Elul. We return to a different feeling this month. This Rosh Chodesh, this new month, coincides with the return to school for my children. I've created a project for myself and invite you to join with me in this project of #BlogElul and #Elulgram - an opportunity to explore the various themes of the upcoming holidays in words and pictures. How will you "return" this month? Leave your BlogElul post in the linky below! When my son, Sam, was diagnosed with acute myeloid leukemia (AML), one of the first things we learned was that the hospital was about to become our home. For about a month at a time...at least four times. After this sunk into my brain, I started to consider how the room could become home-like for Sam. And for us. 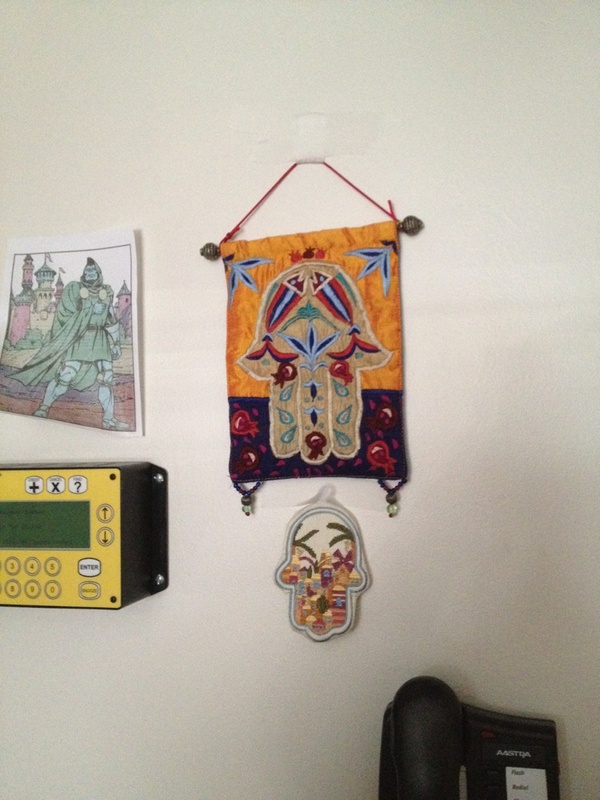 Home is where you hang your mezuzah, after all. In my foggy brain, I recalled that after 30 days, a mezuzah is usually required on the door of a dwelling. But without doing any research at all, I knew that even if we were here for 300 days (God forbid), I wouldn't want to believe that this was a permanent dwelling. So I started to think about what we could do instead of a mezuzah. After all, its basic underlying purpose is to bring blessing upon the home, to remind us of our connection to God our community and the blessing that these connections are to us. So I went to our home and I looked around for a symbol of blessing that I could transport to this temporary dwelling place. Not only is it a blessing, but a reminder of home. When our time in the hospital comes to an end, I will place these amulets back on the wall at home. I will say a prayer of gratitude and thanksgiving, a prayer of survival and success. Trust me, I'm planning ahead. For now, its presence brings blessing here in the hospital. For those interested: the halacha (legal interpretation) of mezuzot actually suggests that a hospital room is, in fact, a temporary dwelling that I do not own. Therefore I am not required to place a mezuzah on the door no matter how long our stay in the room. In addition, I have learned that the practice of reaching up to touch the mezuzah upon entry into a room can actually spread bacteria in a hospital and is now discouraged in Israeli hospitals. "Air-kissing" the mezuzah is now the suggested practice. Seven and a half years ago, I was somewhat enchanted with an idea that appeared in the Jewish news of the week. On March 1, 2005, Jews around the world marked the end of the 11th cycle of Talmud study known as Daf Yomi (daily page). I said to my husband....let's do it. Let's start the 12th cycle. It starts on March 5, 2005, and ends on August 2, 2012. He agreed. I said...I'm going to blog about it. He said....go for it. I had been out of rabbinical school for under 2 years. Michael was still a few months shy of his ordination. Life was so different. Was it easier? It's hard to remember back that far. Remember, now I've got four kids. And by the way, I didn't even have Facebook until May 9, 2007. If you're interested, I joined Twitter on February 8, 2008. And I started this blog in February of 2007. There are 17 posts on that Daf Yomi blog. We read 20 pages of Talmud. I don't remember much about why we gave up, except that it was hard to do it. We didn't have a class or a podcast or anything that kept us going. Just two people sitting together, hoping to get through the whole daf. We were such amateur rookies! It's not because I don't see value in Talmud study. Heavens - I do! So much to be learned and to share. And I'm not even going to do it because I'm "too busy." Sure, it's a great excuse. There's a lot going on in my life, no question. But it's not a good enough excuse to not study. I'm just not going to do this particular project. I think the real reason is that I have so many things I'm interested in. There are so many books and blogs to read, so many newspaper columnists and writers and teachers who saying things that teach and inform me. There are people to see and talk to and engage with. And there are movies to watch and television shows to see and silly, wonderful stuff to do...like take a picnic at the beach. I am constantly learning. From so many places. Daf Yomi can wait. (Forever, maybe!) I am loving the broad spectrum of learning that I gain on a daily basis from a variety of sources. I'm not prepared to focus my learning on one place, with one goal. It's admirable. But I'm interested in a broad-spectrum look right now. Like Miriam Krule, I continue to love the study of Talmud. I don't do it every day. But when I do, I love the opportunity to read more than one page. Or to skip around. Or to only study a short passage in depth for a long time. Each and every day brings new opportunities for learning...of all kinds. May those opportunities all bring blessings.